The United Arab Emirates has a hyper-arid climate. Irrigation is essential for dates (Phoenix dactylifera L.), an important crop economically and culturally. Groundwater is relied on, yet it is a non-renewable resource at the rate it is being used. Furthermore, as the water-table drops, it is becoming more saline. Law no. 5 has been passed in Abu Dhabi to regulate the use of groundwater and set allocation limits for agriculture. For assessing the allocation of irrigation water to date farms under Law 5, we carried out measurements of tree water-use by the compensation heat-pulse method, complemented by measurements of the changing soil-water dynamics using time domain reflectometry and bulk soil electrical conductivity. 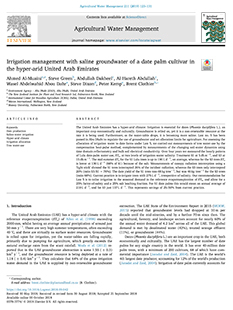 Over four years we measured the hourly pattern of Lulu date-palm water use, ETc, at two levels of irrigation-water salinity: Treatment S1 at 5 dSm−1, and S3 at 15 dSm−1. The mid-summer ETc for the S1 Lulu trees is up to 190 L d−1, on average, whereas for the S3 trees ETc is lower at 130 L d−1 (68% of S1) because of the salt. Measurements of canopy radiation interception using a ‘light stick’ showed the S1 trees intercepted 26% of the incident radiation, whereas the S3 trees only intercepted 20% (ratio S3/S1=76%). The date yield of the S1 trees was 68 kg tree−1, but was 46 kg tree−1 for the S3 trees (ratio 68%). Current practice is to irrigate trees with 275 L d−1, irrespective of salinity. Our recommendation for Law 5 is to tailor irrigation to the seasonal demand in the reference evapotranspiration of ETo, and allow for a 25% factor-of-safety and a 25% salt leaching fraction. For S1 date palms this would mean an annual average of 210 L d−1, and for S3 just 137 L d−1. This represents savings of 25–50% from current practice.